Today, everyone is a typographer. If you have access to a keyboard and a basic software program, you have control over typography. For instance, if you construct email, write for a blog or build presentations, you have a type of control (pun intended) over your words and letters that your great grandfathers would envy. Be thankful. Typography used to only be an art form available to the ink-stained laborers of the early 19th century. A lot has changed since the days of Gutenberg, but the sad reality is that even though today’s presenter has control over type, most don’t quite understand -- much less utilize -- it as an art form. It is one, and its power can be immense. For starters, if you have a brand style guide, stick to it. 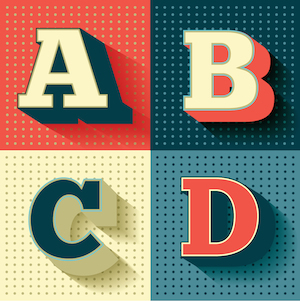 There are most likely 1-2 fonts that you must adhere to to keep brand consistency. If so, follow the rules. If not, take advantage of the opportunity to seek out a new font that is still visually engaging and in a similar font family. I always recommend aiming for only two font styles. Why? One font style is too boring. Three font styles are too much. Consider two font styles as the Goldilocks approach. It’s just right. If you insist on using multiple fonts, three should be the absolute cap. A few years ago, Masayoshi Takahashi changed the presentation industry by rolling out a big text approach to presenting. Think 500 point size. Large font is all he utilized on his slides. It was go big or go home, and it’s a simple and easy design tactic that anyone can implement. Remember, typography is an art. You aren’t going to become a typography expert overnight but you can definitely start building some more engaging slides by understanding the rules. Scott Schwertly is the author of How to Be a Presentation God and CEO ofEthos3, a Nashville, TN-based presentation boutique providing professional presentation design and training for national and international clients, ranging from Fortune 500 companies to branded individuals like Guy Kawasaki.